Copyright LindaHoodSigmonTruth.com May, 2009 – 2018 All rights reserved. This copyright covers every page of this web site and ALL of my original material contained therein. ELVIS HAS BEEN VOTED THE KING OF MUSIC FOR THREE YEARS IN A ROW!!! LET’S ALL BAN TOGETHER AND VOTE FOR ELVIS EVERY SINGLE DAY THIS YEAR SO WE CAN MAKE IT FOUR YEARS IN A ROW!!!! THE KING for 2018 ! So do NOT forget to vote for these two categories also!!! The menorah was originally owned by the family of George Copen, who moved to Tupelo from New York in 1953. Copen, now 75, told me that his childhood best friend in Tupelo was a boy who lived across the street named Jim McComb. Jim’s mother, Janelle, was a close family friend of the Presleys. She first met Elvis when he was just a two-year-old, beginning a friendship that would last until Presley died in 1977 at his Graceland mansion in Memphis. Elvis was 13 when he and his parents left Tupelo for Memphis. When Gladys died in 1959, he made sure to put a Star of David on her headstone at a Memphis cemetery, in honor of his Jewish heritage. After Elvis died in 1977, Gladys was reinterred at Graceland. Her new gravestone, lacking Elvis’ attention, didn’t get a Jewish star. Toward the end of his career, there are photos of Elvis wearing a chaipendant during concert performances. In fact, he was reportedly wearing both a chai and a cross the night he died. In Memphis, he belonged to the Jewish Community Center and gave money to several Jewish organizations, including $150,000 to the Memphis Hebrew Academy. I wish everyone a very happy, safe and blessed July 4th holiday. I have made it my own special 4th celebration for many years to play the below song by Elvis. I would get out my 45 record and play it for years. Now there are so many good versions on the Internet so that it is no longer the way I carry out my tradition. It is my opinion that this song, played with Elvis singing it, should be our National Anthem. Better not see anyone “taking a knee” to this! The 41st anniversary of the death of Elvis Presley is soon approaching and Elvis fans and family members from around the globe will once again be flocking to pay their respect on August 16. Every year thousands of dedicated fans will return to Graceland mansion to hold the yearly Elvis Week celebration. Elvis Week begins on August 9th and continues thru the 18th in Memphis. A week-long celebration in honor of Elvis Presley includes celebrating the music, movies, and legacy of the King of Rock ‘n’ Roll. Graceland.com has recently posted a full schedule of events and ticket pricing list including news on the annual Candlelight Vigil at Graceland honoring the 41st anniversary of the late King of Rock N’ Roll Elvis Presley. Tickets for Elvis Week are now on sale and Graceland.com suggests ordering earlier to secure your place at what is expected to be a maximum crowd. This year there are three special ticket packages being offered to fans. The first package “Elvis Week Elite” offers very limited seating comes in at $1500. The Elite Package purchases are limited to six (6) per person/transaction. The Elite Package can only be ordered over the phone. The next step down package Elvis Week Premier PLUS Package is priced at $685 and also includes a Lisa Marie Presley Autograph Opportunity. While not as extensive as the VIP package there is still a lot of activities to enjoy throughout the week for a cheaper price. Finally, there is a $220 package for Elvis Concerts only. This includes four nights and is one of the hottest selling packages according to the EP site. If you are only able to attend evening Elvis Week events? Our Elvis Week Concert-Only Package features special seating to four exciting nights of Elvis Week entertainment at the Graceland Soundstage. One of my most supportive and hard working friends, Simon Laxon, has outdone himself with his new Elvis/Jesse comparison video. This is definitely one of my favorites. Another wonderful comparison video of Elvis/Jesse by our very talented friend, Simon Laxon. My heartfelt thanks to Simon. Simon Laxon has really worked hours preparing three of his beautiful comparison videos in one day. I am so thankful for all he does to substantiate that Jesse’s face does match Elvis’s so perfectly. I posted the following article on my Facebook pages during the time recently when I was unable to access my web site to add new items. Want to share it here also for those who do not visit Facebook. The following excerpts are from an article which came out recently about the theories that Elvis is alive…one Facebook page was featured two times in this article showcasing their insane garbage. There is a clickable link to that FB page in the second section below which did not copy and paste…you can visit the web site of the whole article to find out the name of the Facebook group…PLEASE DO SO. The group also is shown as furnishing the photo in the first section below although that photo did not copy and paste. Most people will know that Elvis was actually a twin – but his identical twin brother Jesse Garon Presley was sadly stillborn. Not according to conspiracists, though, who cite several errors with dates on his birth/death certificates as proof that he did not die at birth. Apparently there are photos of Elvis pictured with Jesse in 1981 and a 2014 film called ‘The Identical’, starring Ray Liotta, is even loosely based on their story (and the premise that Jesse survived). 7 of the craziest conspiracy theories about Elvis Presley – is The King dead or alive? I want to share with everyone that Jesse called this afternoon while we were away for a Dr. appointment and he left a good message on our answering machine. He is doing well and sounded wonderful. Of course, I am sad that I missed his call, but so happy to know that he is fine and all is well. 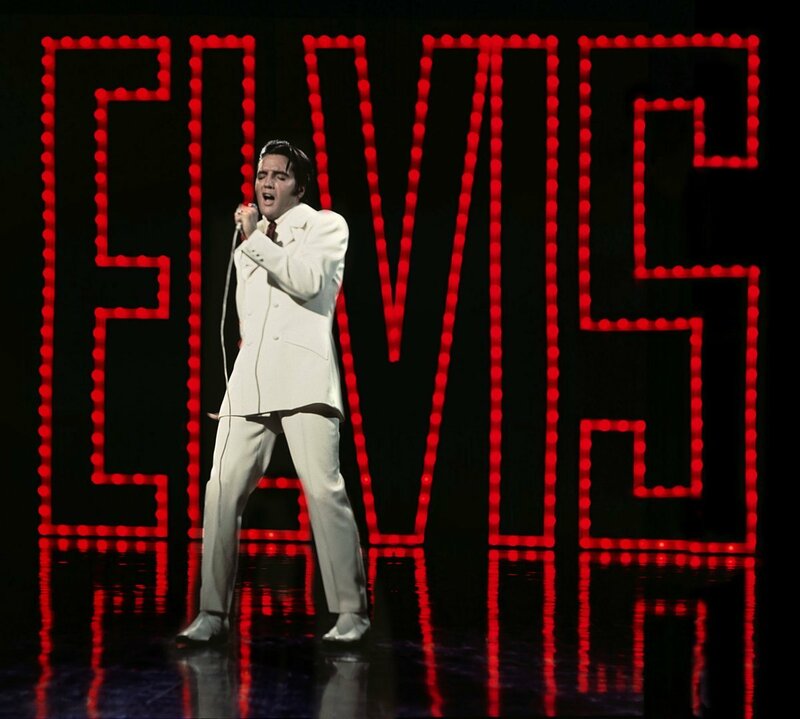 ELVIS’S 1968 Comeback Special, the legendary gig that re-launched Elvis Presley’s career, is to be screen in over 250 cinemas across the UK on August 16. The event coincides with Elvis Week, from August 11 to August 18, as well as the 50th Anniversary of the 68 Comeback Special. Following the incredible gig, the screening will include a walkthrough of the NBC soundstage with insights from producer Steve Binder and Priscilla Presley. The programme was originally aired on December 3, 1968 and marked Presley’s return to live performance and re-launched his singing career. Sony/ATV Music Publishing revealed today (June 13) that it will be a co-producer and investor of the brand new Elvis Presley stage musical, Heartbreak Hotel. The musical, written and directed by Floyd Mutrux, is a prequel to the Tony Award-winning Million Dollar Quartet. The story recounts the astonishing early life of Presley, whose pioneering recordings with record producer Sam Phillips at Sun Records propelled Presley to worldwide fame. Sony/ATV has also agreed to license to Heartbreak Hotel more than a dozen songs recorded by Presley. These include some of his successful early hits, such as “Hound Dog,” “Jailhouse Rock,” “Mystery Train,” Lawdy Miss Clawdy” and “Rip It Up” as well as “Heartbreak Hotel,” Presley’s first Billboard pop No. 1. “I am proud that Sony/ATV is now involved as a co-producer and investor of Heartbreak Hotel, which will not only serve as a fantastic reminder to everyone like me who grew up with Elvis just how unique and special he was, but will be a terrific way for a new audience to discover the music and life of The King of Rock ‘n’ Roll,” said Martin Bandier, Sony/ATV Music Publishing chairman and CEO. The deal was overseen by Sony/ATV Co-President Danny Strick and SVP, Business & Legal Affairs Bruce Scavuzzo. “Heartbreak Hotel had a record-breaking world premiere at the Ogunquit Playhouse and we’re thrilled to finally launch in Chicago. Having Floyd Mutrux, Scott Prisand and Sony/ATV as our partners gives this one-of-a-kind musical the support to become a fan favorite in theaters around the world,” added Corey Salter, Authentic Brands Group president. Below is a different article regarding the new musical “Heartbreak Hotel”. This gives more details about the people behind the production. Sony/ATV Music Publishing has signed up as co-producer and investor of a new Elvis Presley stage musical, Heartbreak Hotel. A prequel to the Tony Award-winning Million Dollar Quartet, the show focuses on the early life of Presley. The new musical is written and directed by Million Dollar Quartet co-creator Floyd Mutrux and is a partnership between Heartbreak King Productions and Authentic Brands Group, owner of Elvis Presley Enterprises LLC. It will have its premiere at the Broadway Playhouse in Chicago on Sunday, July 15. Sony/ATV has agreed to license more than a dozen songs recorded by Presley, including Hound Dog, Jailhouse Rock, Mystery Train, Lawdy Miss Clawd, Rip It Up and Heartbreak Hotel. The deal was overseen at Sony/ATV by co-president, US, Danny Strick and SVP, business & legal affairs Bruce Scavuzzo. I haven’t shared anything which I have received from Jesse for quite some time. On June 20th, I received the below gift from Jesse. He told me about it over the phone before he actually got it sent out to me. Jesse said that this was his Mama’s perfume bottle and that he recalled seeing it on her dresser “for.r.r.r.r.r.rEVER“. Of course, I love it and told Jesse that I would keep it always and that it sits on my own dresser now. I thought my visitors would enjoy seeing it also. Just to share with everyone, Jesse called me earlier tonight. We did have a very good chat though not too long. We compared notes about our most recent Dr. visits for which we both got good reports. We discussed a business decision also. I had a request from a person with a Russian TV Center for an interview. She was very nice and respectful. I had declined the offer of the interview but told her that I would tell Jesse about it just in case he would want me to do it. Jesse and I decided that there would be no purpose served by my doing this interview. I was honored by her request though and it made me feel good when she told me that she had been getting letters from people asking her to interview me. Jesse said something like “The Russian people must love me!” and I said “Oh yes, they do!“. MEMPHIS, Tenn.–(BUSINESS WIRE)–Graceland® in Memphis, Tennessee has announced that Elvis Week™ 2018 will feature more events and performances than ever. Newly announced guests and events include marking the 50th Anniversary of the “’68 Comeback Special” with director and producer of the special, Steve Binder. The recently announced gospel album from RCA/Legacy Recordings, Elvis Presley – Where No One Stands Alone, will be heard for the first time at Graceland during a special listening party hosted by Lisa Marie Presley on August 11, and an unprecedented ten concerts will feature music from guests Darlene Love, members of The Imperials, members of The Stamps, Rockabilly and Outlaw Country artist Dale Watson and Elvis’ friend and country star TG Sheppard and his wife, Kelly Lang. A new wedding chapel called The Chapel in the Woods will be opened on August 13 and available August 14 for couples to get married or renew their vows, and two new exhibits will be unveiled at Elvis Presley’s Memphis ™. The new Lisa Marie: Growing Up Presley exhibit will open on August 10 when Lisa will cut the ribbon. It will include personal items from her childhood including her record player, roller skates and clothing, as well as items from her musical career. The exhibit explores Lisa the daughter, the mother, her charity work, her career, as well as how she continues to carry on her dad’s legacy at Graceland. As part of “Elvis: The Entertainer Career Museum,” Where No One Stands Alone: The Gospel Music of Elvis Presley is an expansion which includes his three GRAMMYs, sheet music, original acetates, and much more, all related to Elvis’ love of gospel music. Also new to Elvis Presley’s Memphis is the just-opened Hillbilly Rock exhibit featuring country music and early rock ‘n’ roll artifacts from The Marty Stuart Collection. On August 13, Darlene Love, one of Rolling Stone’s “100 Greatest Singers of All Time,” Rock & Roll Hall of Fame inductee and lead singer for The Blossoms, who sang with Elvis in the “’68 Comeback Special,” will rock the Graceland Soundstage in her first-ever appearance at Elvis Week. Darlene and her band will perform the hits that made rock ‘n’ roll history, such as “He’s a Rebel,” “The Boy I’m Going to Marry” and “Da Doo Ron Ron,” plus a special tribute to Elvis. Elvis’ Imperials will join former members of The Stamps Quartet on August 14 for The Gospel Music of Elvis Presley Celebration Concert. Imperials Terry Blackwood, Darrell Toney and Lynn Royce Taylor and former Stamps Ed Hill, Donnie Sumner, Bill Baize and Larry Strickland will be on stage for a special night of gospel music. On August 15, Conversations on Elvis: Gospel features those who spent many hours performing gospel music alongside Elvis, both on and off stage. Confirmed guests include host Andy Childs; Dr. Emily “Cissy” Houston, who was a member of The Sweet Inspirations; former members of The Stamps Quartet, Ed Hill, Donnie Sumner, Bill Baize and Larry Strickland; and Terry Blackwood, Jimmy Murray and Armond Morales, who performed with Elvis as part of The Imperials. On August 16, fans and friends are invited to an open house at the new Chapel in the Woods between 11:00 a.m. and 4:00 p.m. and to enjoy wedding cake to celebrate the opening. The new chapel is located just south of The Guest House at Graceland™. For the last 18 years the original Chapel in the Woods was host to almost 2,000 weddings, dedications, and vow renewals. The all-new chapel features modern design and architecture and is officially open for reservations as soon as August 14, 2018. Also on August 16, at The Guest House Theater at 3:00 p.m. – Niko Live in Concert. Italian singing star Niko will make his first appearance at Graceland. Niko has opened for Celine Dion, toured with Chicago and the Doobie Bros. and performed to a sold-out, standing ovation audience at Carnegie Hall in New York City. This is a not-to-be-missed concert event, featuring a live stage introduction by ’68 Special director/producer Steve Binder. On August 17, Conversations on Elvis: Elvis Connections will be held at the Graceland Soundstage and will feature those whose connections to Elvis varies from personal to professional. Special guests this year include: Ann Moses, who was editor at “Tiger Beat Magazine” from 1965 – 1972 and sat on the stage for Elvis’ “’68 Comeback Special,” toured Elvis’ and Colonel Parker’s offices, observed filming for “Change of Habit” and attended Elvis’ opening show in July 1969 in Vegas; Billy Blackwood, James Blackwood’s younger son, who toured with Voice, the opening act for the Elvis Presley in the 1970s; Donna Rhodes Morris, who sang harmony on the original Elvis recordings of Elvis’ “In The Ghetto,” “Kentucky Rain” and “Suspicious Minds”; Elvis’ friend and country star TG Sheppard; and Mark Kogan, who worked with Concerts West to promote Elvis’ concert tours. The week will end on August 18 with a special afternoon performance by TG Sheppard and Kelly Lang in Concert at The Guest House Theater at The Guest House at Graceland and the special Elvis Live in Concert – with an All-Star Band in the Graceland Soundstage. The show will celebrate the King of Rock ‘n’ Roll’s greatest hits with Elvis live in concert and on the big screen, in the tradition of Elvis’ legendary, live concert tours. A live, rock ‘n’ roll all-star band will accompany Elvis and bring this stage production to life at Graceland with former members of The Stamps Quartet and a very special guest appearance by legendary TCB band member Ronnie Tutt. About Graceland and Elvis Presley Enterprises, Inc.
“That humidity slaps you in the face,” confirmed country music star Kellie Pickler. Delightful? Are daily high temperatures in the fiery 90s delightful? Except to the hotel and to the set, because there’s not much time for tourism when you’re in town to shoot a feature film in 20 days. Snow? Of course, the “snow” is an illusion, created with blankets of lightweight white fabric and spray-on flakes of recycled damp paper, the consistency of spitballs. But even an artificial snowfall in July is a remarkable sight, especially in a city all but melting like a dropped Popsicle under a blistering heat wave. So credit movie magic, Hallmark sentiment, the miracle of the Yuletide season and the power of Elvis for bringing Christmas in July to Memphis. It’s here, in Elvis’ longtime hometown, that the Hallmark Channel is currently in production on “Christmas at Graceland,” a movie romance set to be the crowning star atop the cable network’s 2018 “Countdown to Christmas” tree. Starring country singer and CMT talk-show host Pickler as a native Memphian turned Chicago finance executive whose return to her hometown for a bank deal inevitably leads to the rekindling of her passion for music and for her hunky ex-boyfriend and singing partner (Wes Brown), “Christmas at Graceland” is one of 22 (!!) new movies created for this year’s 10th annual “Countdown to Christmas” marathon, which begins Oct. 27 and concludes New Year’s Day. According to Hallmark, the channel’s most loyal viewer demographic for its Christmas movies consists of women ages 25-54. The titles affirm the gender emphasis: Some of Hallmark’s other new movies this year include “A Shoe Addict’s Christmas”; “Pride & Prejudice & Mistletoe,” starring Hallmark stalwart Lacey Chabert; and “It’s Christmas, Eve,” with LeAnn Rimes as the titular Eve. In 2009, Hallmark produced six original Christmas movies; by 2017, the number was 21. “Our audience couldn’t get enough of these movies,” Vicary said, explaining that the films function more or less as the dramatic equivalent of comfort food. “Obviously, Hallmark is such a safe place,” said Pickler, 32, explaining her decision to make her dramatic acting debut in a Hallmark Channel production. The first fiction film to be shot at Elvis’ famous Memphis home, “Christmas at Graceland” was conceived by the “Elvis teams” at Graceland and at Authentic Brands Group, the company that manages the licensing of Presley’s name, image and likeness. Joel Weinshanker, managing partner for Graceland Holdings LLC, said Graceland approached Hallmark because the “brands” share similar philosophies. While most Hallmark Christmas movies are shot in Vancouver, “Christmas at Graceland” was — true to its title — shot in the former Elvis stomping grounds of Memphis and North Mississippi, with scenes set inside and outside Elvis’ home and at the nearby Guest House at Graceland hotel and at the Elvis Presley’s Memphis attraction across the street. The crew worked around Graceland’s public hours, so that shooting did not disrupt the tour schedules that bring some 600,000 visitors to Elvis’ home each year. The only set constructed for the film was a recreation of the Graceland music room, built inside the performance soundstage at Elvis Presley’s Memphis, and “dressed” with drapes, a piano and furniture formerly owned by Elvis. To mimic the winter setting, special effects teams transformed Graceland into the type of visually appealing winter wonderland rarely seen in real-life Memphis. Workers placed white eco-friendly “geotextile” tarps known as Terram on the grass to mimic blankets of snow and sprayed moist paper “snow” onto bushes and trees. The actual Graceland Christmas lights and decorations were pulled from storage early, to re-create the mansion’s holiday look. After about three weeks of pre-production in town, shooting on “Christmas at Graceland” began July 9 and is scheduled to conclude July 29. Budgeted at a bit more than the $2.5 million typical for a Hallmark production, the film employed a crew of about 90 people, including about 40 Memphis hires, according to line producer Ryan Westheimer. With a soundtrack scheduled to be loaded with Elvis recordings and Pickler covers of holiday classics, “Christmas at Graceland” concludes with a Graceland concert scene that gives both Pickler and Brown a chance to sing, beneath a fall of inauthentic snow. The first part of the scene was shot Thursday night, in front of the entrance to the mansion; viewers will see a picture postcard vignette, but participants in the shooting are more likely to remember the 90-degree heat than the twinkling Christmas lights. But what’s a little heat on the way to Christmas romance? Spoiler alert: “Of course, all Hallmark movies have happy endings,” Pickler said. Another attraction for Elvis week…the Circle G ranch. The people behind the renovation of Circle G Ranch will give the public their first chance to see what has been happening at the site of music legend Elvis Presley’s ranch and honeymoon cottage at the corner of Highway 301 and Goodman Road in Horn Lake. That opportunity will come during the upcoming Elvis Week feativities in Memphis next month. The group of investors led by Mississippi native Davage “Buddy” Runnells Jr., founder and owner of Real Estate International Inc. (REI), has been working on their renovation project since acquiring the property in 2014. On Sunday afternoon, Aug. 12, the ownership group is holding “A Day at the Ranch” at the site between 1-6 p.m. Representatives of the owners made the announcement exclusively to the DeSoto Times-Tribune Thursday afternoon. Admission will be complimentary, although a $5 fee for parking onsite will be charged and the limited parking will be first come, first served. Festivities will include live music, food vendors, a meet and greet with the Memphis Mafia, returning to the ranch after 50 years, with stories and merchandise. There will be children’s activities, a preview of the Unknown Child Holocaust Memphis, photo opportunities and more. The “Memphis Mafia” was the group of Elvis’ friends and others who accompanied and protected him during his musical career until he died in 1977. Experts will be on hand to talk about the history of the Ranch and explain the owners’ efforts to nominate the property to the National Register of Historic Places. Visitors are encouraged to bring their own blankets and chairs. Outside food and beverage and personal coolers will not be allowed. Those who come will also have the chance to view conceptual plans for restoration of the Ranch and development as a culturally inspired entertainment destination that celebrates the heritage and achievement of the Mississippi Delta community. While this is the first open, public event at the ranch, it may be the last one for awhile, as Circle G will close to regular tours after Aug. 12 to allow restoration to continue. The 231-acre tract of land known as Circle G includes 163 acres that Presley owned with wife Priscilla. The land also has the stables where Elvis and Priscilla kept their horses, a 14-acre lake and a prominent 55-foot cross. The current investors have exciting plans for the future of Circle G Ranch as an entertainment destination that preserves historic features, embraces the local community, and honors causes about which Elvis felt most passionately, such as children with special needs, and also active military and veterans. Bob Bakken is Staff Writer for the DeSoto Times-Tribune. My wonderfully talented and supportive friend, Simon Laxon, has created two more great photo comparison videos. The contributions of his hard work and loyalty mean so much to me and I know that my visitors find his substantiating proof that Jesse is Elvis most validating and enjoyable as well. I found something interesting in a news article of which the topic does not pertain to Elvis at all. Below is a brief excerpt from the article. I was pleasantly surprised to see that the city of Shreveport, Louisiana has a street named for Elvis. Of course, this is very fitting as Elvis performed there early on in his career many times on the Louisiana Hayride. He did shows there from 1954 to 1956. SHREVEPORT, LA – The City of Shreveport is hosting a job fair today. The job fair continues until 6 p.m. Thursday at the Municipal Auditorium, 705 Elvis Presley Avenue. The crew for the Hallmark Channel USA‘s film #ChristmasAtGraceland has taken over the front lawn of ELVIS PRESLEY‘s home. In the middle of July, the production has created a little winter wonderland in #Memphis. We’ve got more #BTS looks coming to you from our recent set visit. Stay tuned. This looks like a good magazine. You can buy a single issue to try it out before subscribing by the year. The below special offer has expired. I am showing the image only so that everyone can get an idea of the magazine’s appearance. Andrew Hearn updated his cover photo. (GRACELAND NEWS RELEASE) – A highlight during Elvis Week™ 2018 is The Auction at Graceland when collectors, fans and pop culture enthusiasts from around the world will raise their paddles to bid in hopes of going home with a piece of Elvis history. The auction will include artifacts from across the spectrum of collecting, including items owned by Elvis, gifted by Elvis, signed by Elvis, used by Elvis and created to promote the king and his career. Every lot in this auction has been thoroughly researched and certified by Graceland Authenticated, the authority in Elvis and pop culture authentication. For more about The Auction at Graceland, visit GracelandAuctions.com. Online bidding is now open for the auction, which will be held on Sunday, August 12 at 1:30 p.m. EDT/12:30 p.m. CDT in the theater at The Guest House at GracelandTM, and online at GracelandAuctions.com. Every artifact is authenticated by Graceland Authenticated, LLC. All of the items in the auction will be offered from third-party collectors and none of the items will come from the treasured Graceland Archives. The mansion and all artifacts in the Graceland Archives continue to be owned by Lisa Marie Presley and are not for sale. Highlights will be displayed at Elvis Presley’s Memphis TM from July 23 through August 10th and on August 11th in the Rock conference room of The Guest House at Graceland. The Auction at Graceland collectible catalog is now available to order at ShopGraceland.com and features more than 200 pages of photos and details of all the auction items. Collectors wishing to bid in the live auction event can register for a paddle on Saturday, August 11th from 10:00 a.m. to 5:00 p.m. and Sunday, August 12th from 10:00 a.m.-11:00 a.m. in the Rock Conference Room at The Guest House at Graceland. Collectors with an existing bidding account can reserve a paddle for in-person bidding by emailing auctions@graceland.com. Advance registration is recommended. Online bidding is now open. To register and bid online visit GracelandAuctions.com. For more information about how to submit items for authentication by Graceland Authenticated, please visit www.gracelandauthenticated.com. To have an artifact considered for inclusion in future Graceland Auctions, please email consignments@graceland.com. I thank my good friend, Dennis M., for sharing the below photo with me. This is similar to others I have shared of Elvis in his DEA Staff jogging outfit. But, I think this one is really good and clear. I think I may have posted this quote from Elvis before, but the truth remains just as true today. Below are some great new photos to be added to my page devoted to Elvis’ involvement with the Federal Government and other law enforcement agencies. The photos were shared with me by my good friend, Dennis Miller. I sincerely thank Dennis for his supportive friendship. I want to share that Jesse called me, a little bit ago, this afternoon. We had a good visit and talked for a good while. He is well and sounded great. We discussed different movies and music that he is interested in seeing and hearing. He does not have any Internet access and therefore some of the movies which he reads about and wishes he could view are made by Amazon and are only available for viewing on line. It is a shame that they don’t put their movies out on DVD’s. If they did, I would get those for him. As always, his call made my day so much more wonderful.